This cornucopia of comedy showcases works by major playwrights and emerging young writers, with casts of all sizes and diverse and challenging roles for actors of every age and type. You’ll discover such colorful characters as a businessman free-falling from a plane, an embittered sword swallower, a punkish girl skateboarder, and retirees in post-apocalyptic Siberia, alongside plays that unleash the humor in high school reunions, alien invasions, office cubicle farms, and even post-Katrina New Orleans. 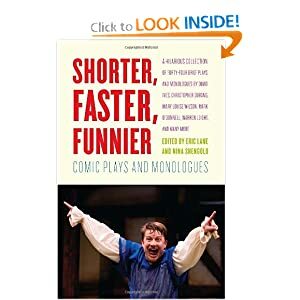 Perfect for actors, students, theater lovers, and comedy fans, Shorter, Faster, Funnier covers the spectrum of humor, from slyly witty to over-the-top outrageous.